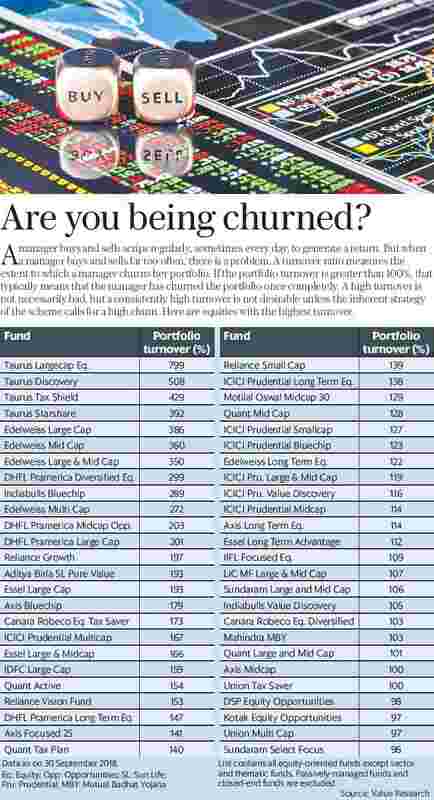 Mutua fund turnover ratio measures the extent to which a manager churns her portfolio. A manager buys and sells scrips regularly, sometimes every day, to generate a return. But when a manager buys and sells far too often, there is a problem. A turnover ratio measures the extent to which a manager churns her portfolio. If the portfolio turnover is greater than 100%, that typically means that the manager has churned the portfolio once completely. A high turnover is not necessarily bad, but a consistently high turnover is not desirable unless the inherent strategy of the scheme calls for a high churn. Here are equities with the highest turnover.